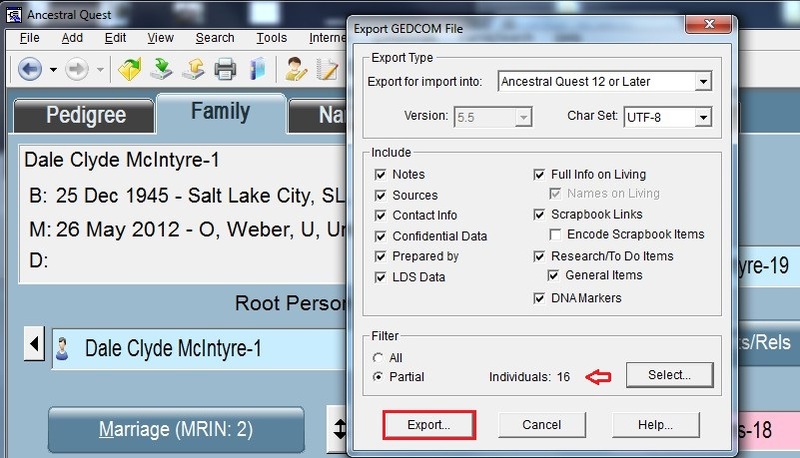 In the previous article on Descendant Research, we discussed how to download the descendants of an ancestor from the FamilySearch Family Tree. There is much information available in Family Tree, however, the research on that information is sometimes questionable. I recommend that you not import this information directly into a good file. How then should someone handle this information? 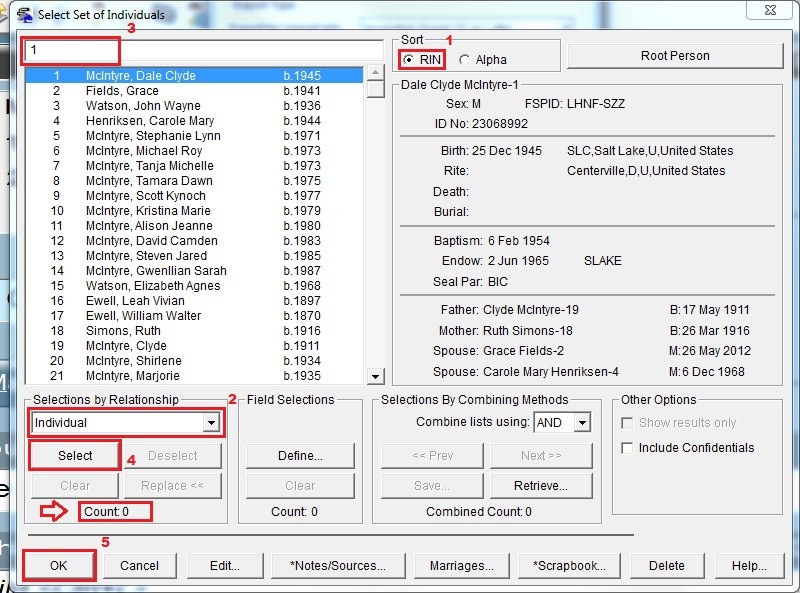 I recommend that you create a separate file for the descendants of ancestors. There you can examine it and determine what you do and do not want to incorporate into your file. 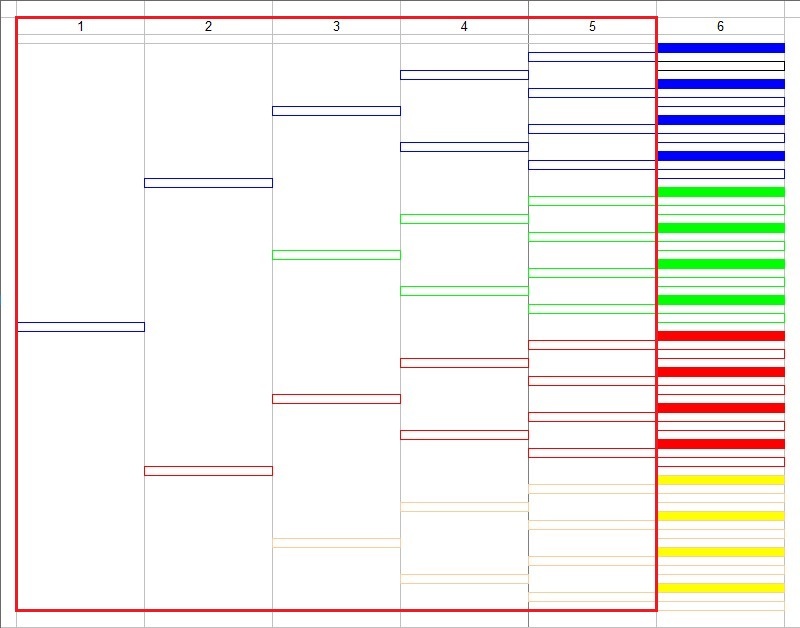 This is a six generation pedigree chart. 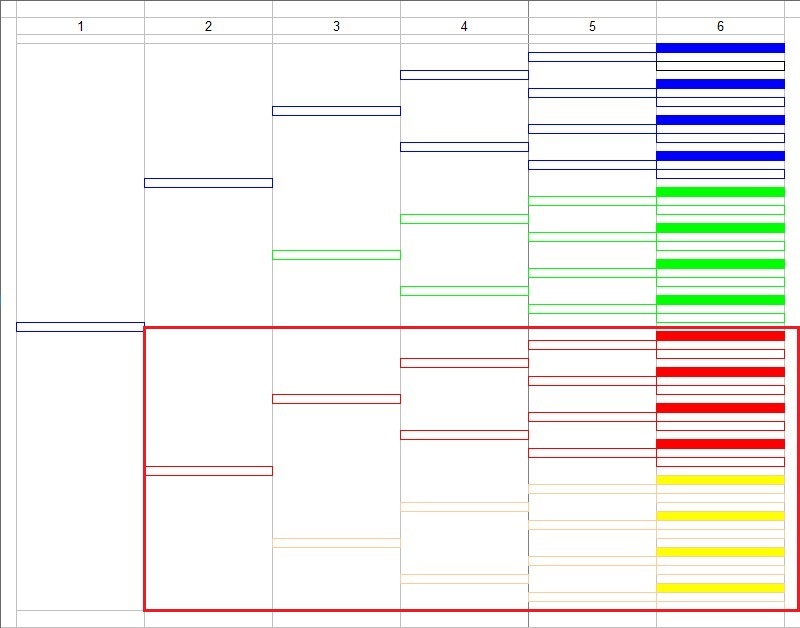 It shows standard Color Coding, but with the males in the 6th generation highlighted. 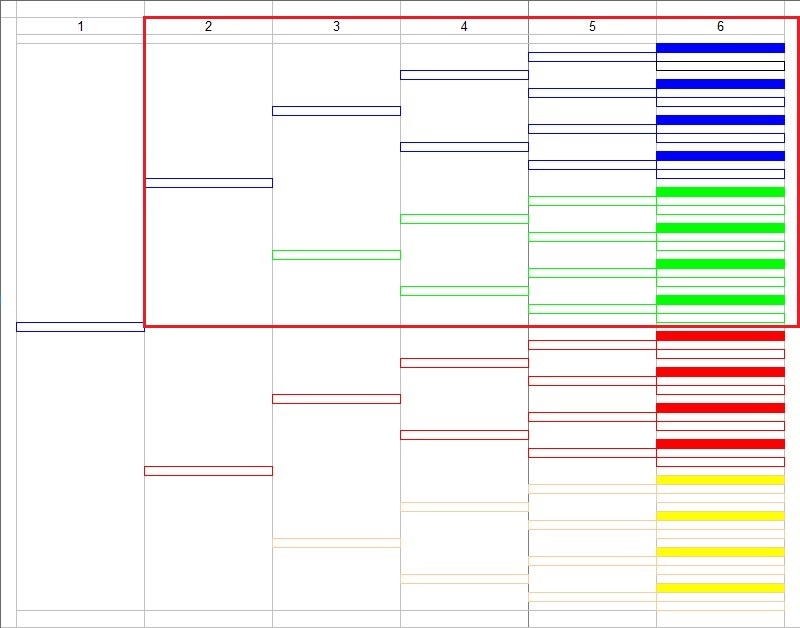 To accommodate various screen resolutions and sizes, only five generations are shown on the Pedigree view of Ancestral Quest. 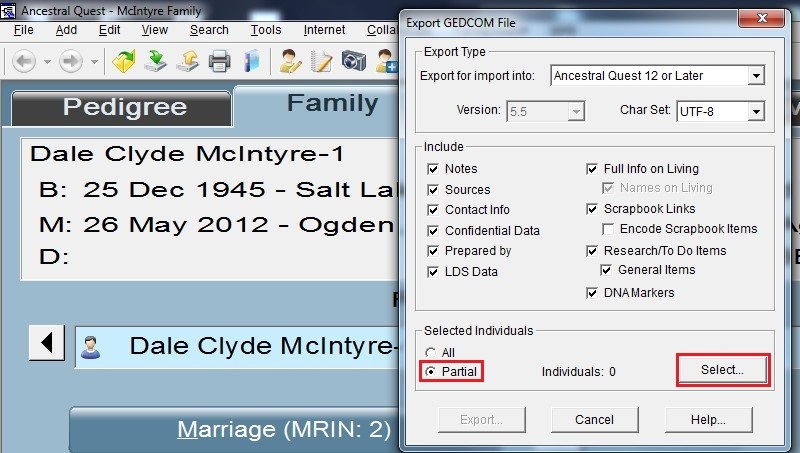 Standard procedure for descendant research as taught at the Ogden FamilySearch Library is to begin with 3rd great grandfathers. They are the sixth generation when you are the principle person in the Pedigree view. These are the couples just off screen to the right. 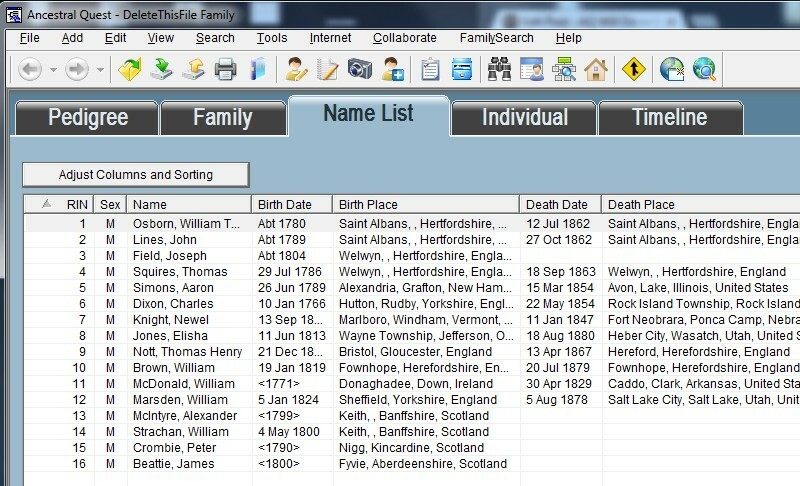 To see your paternal 3rd great grandparents, click on any of the top eight arrow buttons to the right of the last generation in view. then click on any of the bottom eight arrow buttons to the right of the last generation in view. This will show your maternal 3rd great grandparents. Here is the procedure I recommend. Start with your paternal 3rd great grandparents. Write the RIN numbers of the eight males on a list. If one of the males is missing, but his wife is present, write her RIN. If both are missing, drop down one generation, toward you, and write the RIN for that person. Another way to think about this is to start with the principle person, who at this point is your father, and working up the ancestral tree generation by generation, write the RIN for any name you find who has No parents on the pedigree chart. On the sixth generation, write the RIN for only one person from each couple. When this is completed, click on the Home icon, then move to your maternal 3rd great grandparents. Repeat the process of writing RIN numbers to the list for these ancestors. When you are finished, you know everyone who will be on the GEDCOM you are about to create, so click on the Export icon. We only want the people whose RIN we have written, so click the Partial radio button, then click the Select button. On this screen, you will select the people whose RIN you have written. 1. Be sure that the Sort order for this screen is RIN, not Alpha. 2. Be certain that the Selections by Relationship box is set to Individual. 3. Enter a RIN from your list. 4. Click the Select button. Repeat steps 3 and 4 until you have entered all the RIN numbers on your list. 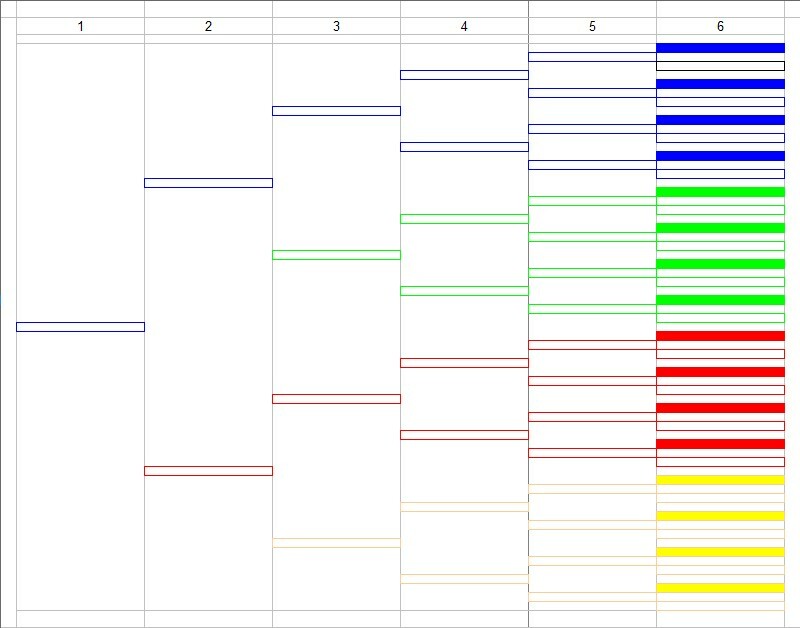 If you were able to select one from each couple in the sixth generation, you will have selected 16 Individuals. If not, the number may be lower. Click the Export button. 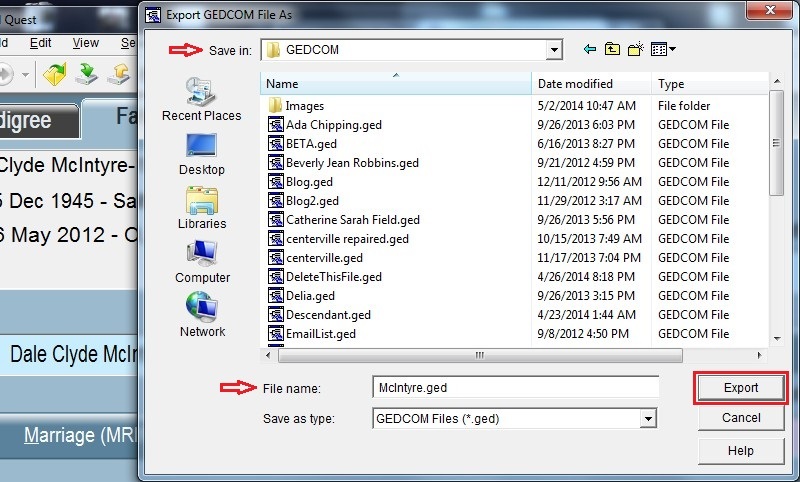 Select the folder where you want to store the file, and give the GEDCOM file the name you want, then click the Export button. The file will be stored where you indicated. tell Ancestral Quest to create the new file. Show Ancestral Quest the folder where you want to store the new temporary file, choose the file name and click on the Create button. 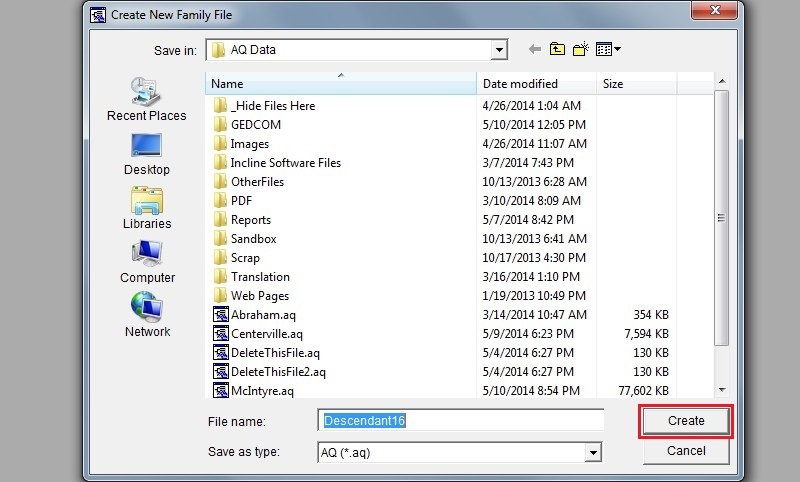 AQ will create the file with no records. 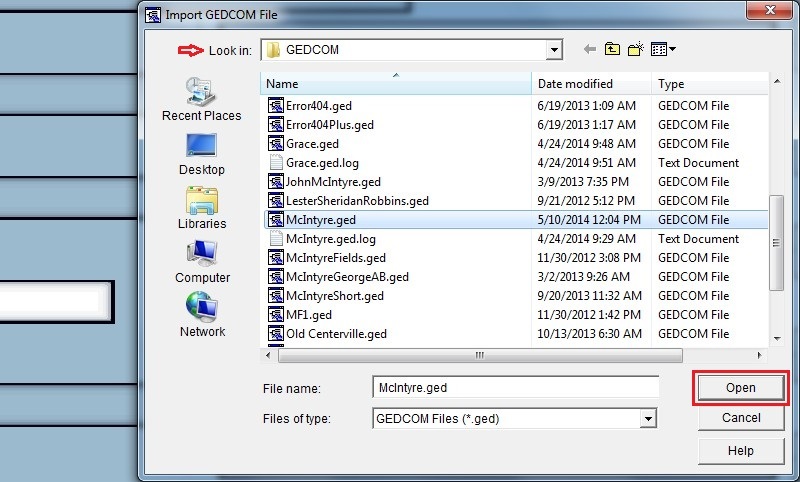 Your next task is to import the GEDCOM file. Click on the Import icon. Be sure that you are looking in the right folder. 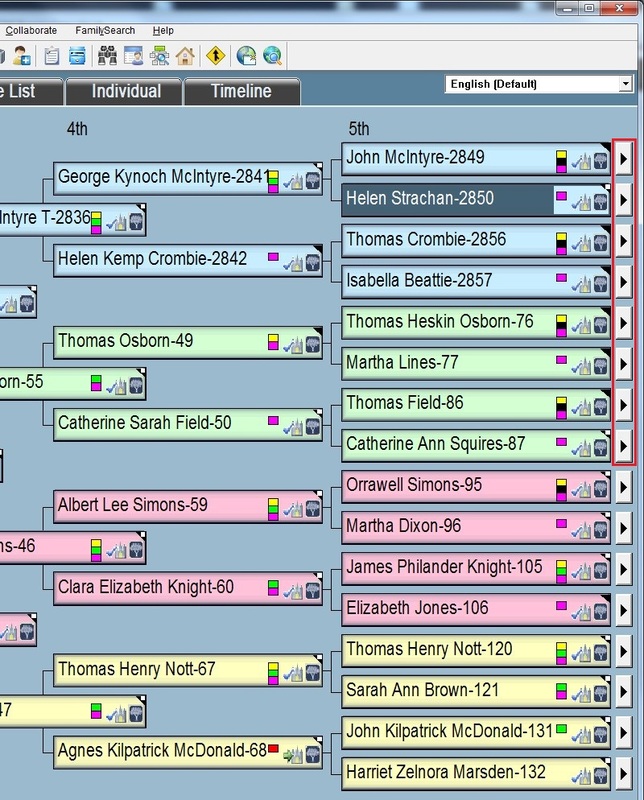 Highlight the name of the GEDCOM file containing your 3rd great grandparents. Click on the Open button. it will look something like this. Make a note of how many records are in the file. Now, refer back to the previous article on Descendant Research, and follow that procedure on each of these records. When you are finished, it is probably a good idea to check this file for possible duplicates. You are now ready to examine what you have returned from Family Tree. What you like, you can put into your real file.